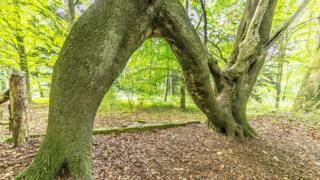 A beech tree grafted into an N-shape to woo a woman called Nellie has been named as England's Tree of the Year. The Woodland Trust, which runs the competition, said Nellie's Tree at Aberford, near Leeds, was formed almost 100 years ago by Vic Stead. It was a move that worked as they went on to marry, the trust said. It is also a popular site for proposals today. The tree, also known as the Love Tree by locals, was nominated by Vic and Nellie's grandson Chris Lund, who wanted to share their story. The English entry secured 2,351 votes, the most votes of any tree in the contest. Kaye Brennan, lead campaigner for the Woodland Trust, said: "There was a lot of love for this northern gem. "Its popularity is a tale of romance and has really captured the public's interest to poll the most votes." She said the aim of the competition was to showcase the UK's best trees to help drive up interest in their value and protection. "The UK's trees could do with a bit more love," she said. Nellie's tree will now compete in a vote to be the UK's contender for European Tree of the Year. The winning trees all receive a £1,000 care grant from the People's Postcode Lottery.